The Bar Devino is a wine and bar cabinet with hidden functionalities throughout. For example, the top surface slides open to reveal a granite work surface and a removable ice sink. The double doors open to reveal shelf space for storage of bottles and accessories of varying heights and widths. 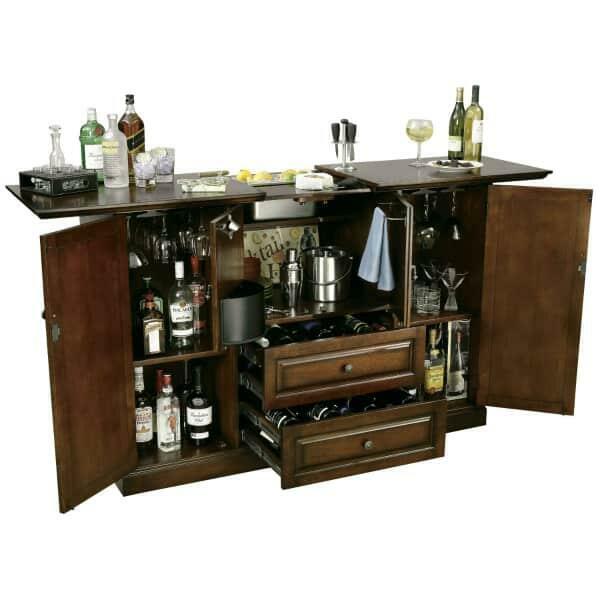 A hide-a-bar console features a fixed bottle opener, a removable catch basket, and a towel bar that is attached to the inside of the cabinet’s center doors. The two tiered nested bottle storage drawers with smooth running metal slides hold up to 28 wine bottles, and there is additional storage with wood stemware racks and one adjustable wood shelf on each side, plus the storage in the center cabinet. The Bar Devino is finished from all sides for flexible placement, whether angled or placed against the wall. The Bar Devino offers functionality and superb shaping for rooms that require shorter waist-high furniture rather than floor-to-ceiling wine cabinets.